A blog is an online diary where you can write about what you see and what you eat. It’s a marvelous thing that you can use to share your culinary experiences for everyone to read. The flip side of having a blog is that others can, and do, read it. 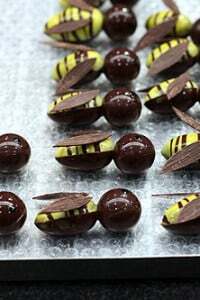 A while back I wrote something about a chocolate shop in the Marais that I once walked by with a friend, a very talented chocolatier from Brussels. He looked in the window and didn’t find the presentation all that enticing. So I wrote a few words about the place here on the site, a comment he made in passing, that wasn’t necessarily glowing nor was it desultory. (Either way, I’m off the hook. He said it, not me.) But it was enough to invoke an email from someone at the company about a year later. But it wasn’t signed by Joséphine Vannier. Maybe it was a pseudonym for Her Divine Greatness! herself. Seizing the opportunity, I responded, saying I’d love to come in and get shown around, hopefully by the elusive Joséphine herself, and to be properly introduced to her chocolates with her expert help. Alas, a response was not forthcoming: I never heard back. But since I live close-by, I decided to stop by and do my own sampling, perhaps catching Joséphine by surprise and getting a look around. The windows at Joséphine Vannier are filled with chocolate sculptures and colorful creations, which range from cunning and clever, to clownish and downright goofy…a line most Parisian chocolatiers like to balance between no matter how chic they are. But I, accompanied by a chocolate-loving friend, made the pilgrimage for her individually-dipped chocolates, stopping to admire the neatly-wrapped army of chocolate bars crusted with salt, tonka beans, red pepper, and spices first. Then I headed to the wall of chocolates, each lined up in picture-perfect rows, packed squarely in sturdy white boxes. A quick side note here: If you ever plan to visit the Marais in Paris on a Sunday, wear heavy-duty football padding. The place is swamped with tourists cramming every square centimeter of the already impossibly-narrow sidewalk space. Clearly in the 1400’s, no one was anticipating how explosive the popularity of this neighborhood would become. While I’m happy to see visitors to Paris enjoying themselves, most of them walk around in a trance, inadvertently block the sidewalks by window-shopping and it’s impossible to stroll comfortably through the quartier anymore. And Sunday is the busiest day of all, since the shops in the Marais are allowed to stay open while the rest of Paris closes up. I normally opt to walk far around the neighborhood rather than getting stuck in the unruly mob. So one might expect the salespeople in the Marais, who work on Sunday, to be a bit grouchy. But Joséphine’s ‘friends’ were almost unnervingly tranquil and obliging. Looking around, it seemed that Joséphine was taking the weekend off, perhaps attending to her faithful elsewhere. But her ‘people’ that she left to watch over the shop were charming and helpful. So we dutifully chose a selection of chocolates to sample in the nearby Place de Vosges. 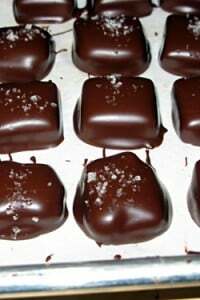 A hands-down favorite of ours was the piquant Pain d’Epices, dipped chocolates with a dusting of spices on top and a burst of peppery-spices in the ganache filling. 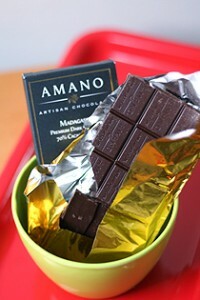 The spices were fresh and strong, although the subdued chocolate was a bit overwhelmed by the assertive flavors inside. The Café Pralinés were cleverly scribbled with a musical note and probably have their own cult-status in Paris. And I especially hypnotized by the Nougat; that airy, tender, honey-scented confection with crunchy nuts enrobed in chocolate. I worship at the altar of anything made with nougat, especially when it’s scented with orange-flower water and vibrant-green Sicilian pistachios here in France. And this divine petit carré was no exception. I never did find out who wrote that letter. I didn’t ask and no one there could recall. But I did ask them where Joséphine Vannier was, or at least who she was. And they replied, almost in well-scripted unison, “Nous sommes Joséphine Vannier”…”We are Joséphine Vannier. So I left a bit puzzled, and I’ll probably never find out who Joséphine Vannier is, or was. Is she someone who started the shop? A historical figure in the rich history of the Marais I never heard of? Or if I ever do meet her, will I need to greet her as—Oh Great Leader! Maybe she’s an enigma, like her shop; a bit coy on the outside, choosing to display to the public her silly side for all to see. A bit colorful and somewhat irreverent. But once she gets inside your psyche, it’s clear she’s more cunning than you might imagine. She reveals a few spicy tidbits here, and some sweet nuggets of goodness there. And from then on, it’s sweet surrender. And I like her ‘friends’ too. Perhaps they’ll invite me to come by for an orientation meeting again. Then, just maybe, I’ll become a full-on convert as well. Aha! The French chocolate version of Betty Crocker! Sweet nuggets of goodness? You mean sweet NUBBINS of goodness.. I mean, nothing is sweeter or better than a nubbin. Am I right? Am I right? Sounds like you and Joséphine Vannier could be characters in a modern day take on a Henry James novel. You are the poor Americain beguiled by and lost in the labrinth of French custom, classism and mystery, in search of a heroine always just beyond your reach=) Might as well just sit back and enjoy the chocolate. We really need a chocolate revolution here in America, and no I’m not talking about Hershey’s. J-P Hevin’s Fish n’ Hen or his Hen n’ Fish combo?! Ridiculous bunnies(of the inflated order) that looked like they walked off someones front lawn. I have tried this shop many times (I lived a block away for 2 months) and it is a huge step down from Debauve, Maison du Chocolate, Patrick Roget, and many others in Paris. However, they are very friendly. Maybe Joséphine Vannier lives in all of us. Thank you sooo much for the very comprehensive book on ice-creams. I don’t think I’ll ever need any other book on this topic. Eye_carl: There is a chocolate revolution in America! How ’bout ScharffenBerger…Theo…Amano…E. Guittard…. Fred F: Yes, I agree. I asked if they made the chocolates there and they said no, which is normal in Paris since space is at a premium (especially in the Marais). Hope you survived unscathed! I need to find out the chocolatier in the Marais we bought gifts from. The window display was stupifying…as most all the store fronts in the Marais. So we were drawn in. Ended up giving my mother a ‘Whitman’s sampler’ with the advance warning of “Don’t give this to the following …children and most all of the relatives. From January through March she gave me a report of each chocolate. So much fun…. 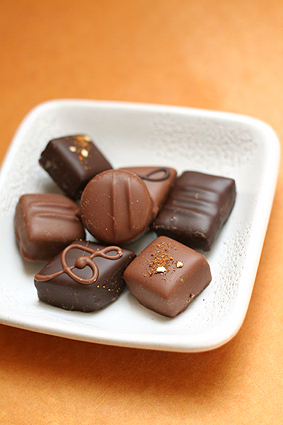 Your Great Book of Chocolate is an absolute delight! I’ve been using only lesser-famed but good quality dark chocolate brands for my recipes instead of milk chocolate and I have to agree that the mass-produced stuff we buy in most U.S. convenient stores is just “junk chocolate”. My chocolate taste buds are now so finicky that Hershey tastes like chalk to me. The dark stuff is much better. Your truffles, btw, were *very* messy as you warned in your book but it was oodles of fun to smear them in melted chocolate in my hands. I seem to have endangered the dieting peers in my work office but it’s worth it to bring in tasty concoctions for them to sample. Thank you for your gracious comments and insights to share with the rest of us. I have been to the shop. Can her products be ordered online and sent to the US? Thanks. Is it very expensive there? Yes, Trang, it’s very expensive, but then all Paris chocolatiers are. And I share Harvey’s query about ordering Vannier chocolates online. I would kill for another Vannier poivre et sel mixed white and dark bar at any cost! Meanwhile, what’s needed are a few recipes on a website somewhere, teaching us how to blend spices and rare salts and peppers with Guittard or the better-grade chocolates now available in groceries, so we can make our own. Does anybody know of such recipes? And for macarons enthusiasts, try Gerard Mulot. They’re fabulous and a bit less pricey than the more famous vendors. I took my daughter to this chocolate shop this past summer, and we devoured our chocolates while sitting in the park nearby. We were thrilled with the tastes. We tried most of the best chocolate shops in town, and while this wasn’t my absolute favorite, both my daughter and I really enjoyed our purchases.